After all that color inspiration from last week’s features I have embraced color a little more and have begun a small color journey in my own home. Check out Aliah’s room refresh sneak peek here! Hopefully the makeover continues on track and I will share it with you soon! Thank you for all the inspiration you linked up last week! There are some new linkers joining in and I am so happy to meet you all! I hope you will continue to share with us each week, I am honoured to have you! 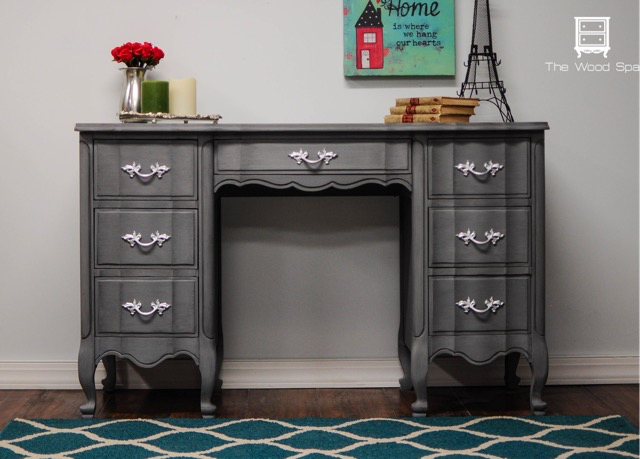 My heart went “pitter patter” over this desk Shared by Patricia from The Wood Spa. The color is gorgeous and I love all the curves! 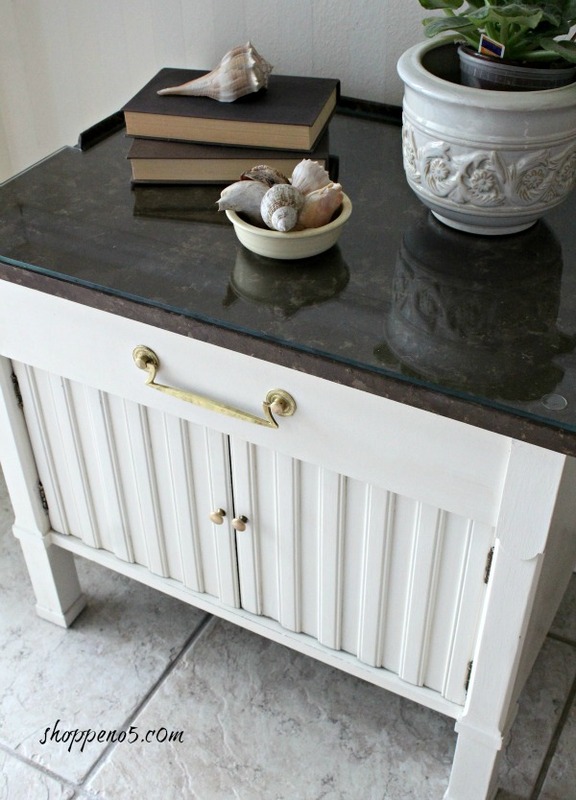 The black glaze accented by those pretty pulls takes this to a whole new level of classy! Well done Patricia! 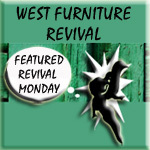 You really must see the before pictures to see the dramatic change this desk went through! 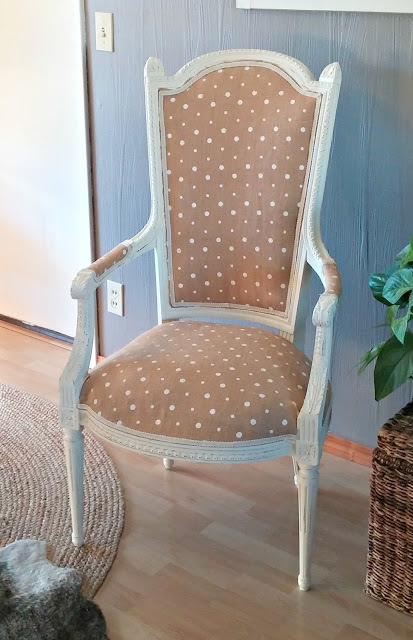 Tania from Little Vintage Cottage shared this sweet side chair makeover. Oh how I love polka dots! Upholstering can be a dirty job … literally! You must go see what she had to deal with to bring this chair to pure sweetness! Even the paint color sounds yummy …. mmmmmm…. cake batter! Well done Tania! Kimm from Reinvented shared her Typography Wall Art. What a great way to add interest to a large wall space. It’s so easy to do and you could use any word to suit your space! Great idea Kimm! Love the modern mixed with rustic feel! 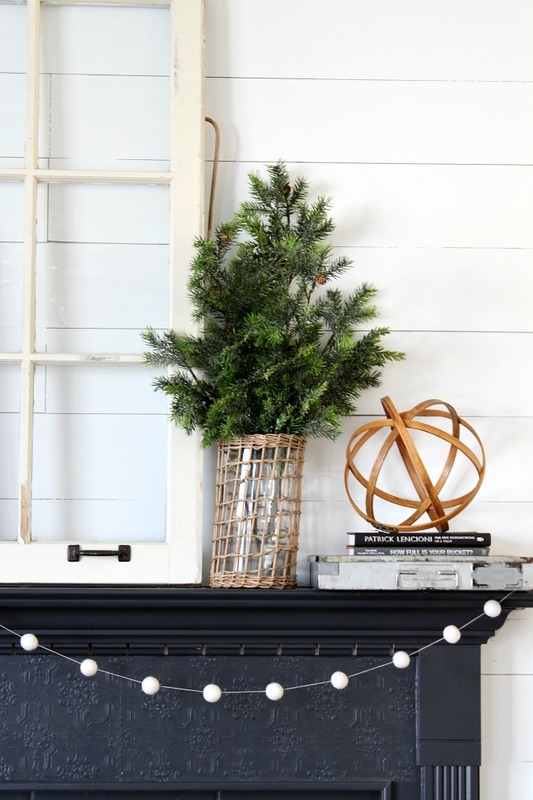 I also couldn’t help but share her idea for DIY Shiplap!!! Seriously loving the look Kimm! You Must check out how to do this! She used MDF believe it or not and got this amazing look! Finally … for those who laugh at those of us who “shop” off the side of the road … I just want to say … who is laughing now??? This gorgeous little curbside find was rescued by Debra from Shoppe No. 5 who saw it’s beautiful potential! You know you were meant to turn the wrong way Debra! Glad you did, it looks beautiful now! Thank you to all who inspire and share here each week! If you missed last week’s party you can check it out here! Don’t forget to leave a note of encouragement for those you visit … everyone loves a kind word or just a quick hello! They are all so good I had a difficult choosing just a few to share this week! I hope you are having a great week and I’m excited to have you share in the inspiration! Hi Terry! Thanks so much for hosting. I think my heart skipped a beat as well on the grey desk from Particia as well. Hope you have a wonderful day! Thank you so much for coming and leaving such a nice comment! I hope you have a great day! So nice to meet you Maria and it’s an honor to host you! I thank you for joining in and wish you a great weekend! I am excited I found your link party. Thanks for hosting! So nice to meet you Sherry! I’m so excited you are HERE!!! Thank you so much for your inspiration! I hope you have a great weekend! Thank you for featuring the curbside find. The other features are so great that I am honored to be in their company. You are so very welcome and very deserving! I hope you have a wonderful weekend! Hey Cynthia! 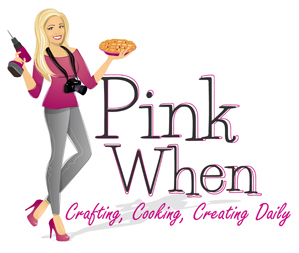 I didn’t give the site a facelift but I have been thinking hard on it … I did however try to design a new party logo …the first one was a little sad ;) Thank you for joining in Cynthia! I always enjoy our visits! I hope you enjoy a great weekend! OH my goodness, thank you so much for featuring my projects! Have a great weekend! You are so very welcome! Thank you so much for joining in your inspiring projects! Hope you have a great weekend! So flattering to see my desk among these gorgeous pieces! Thanks for hosting, Terry. 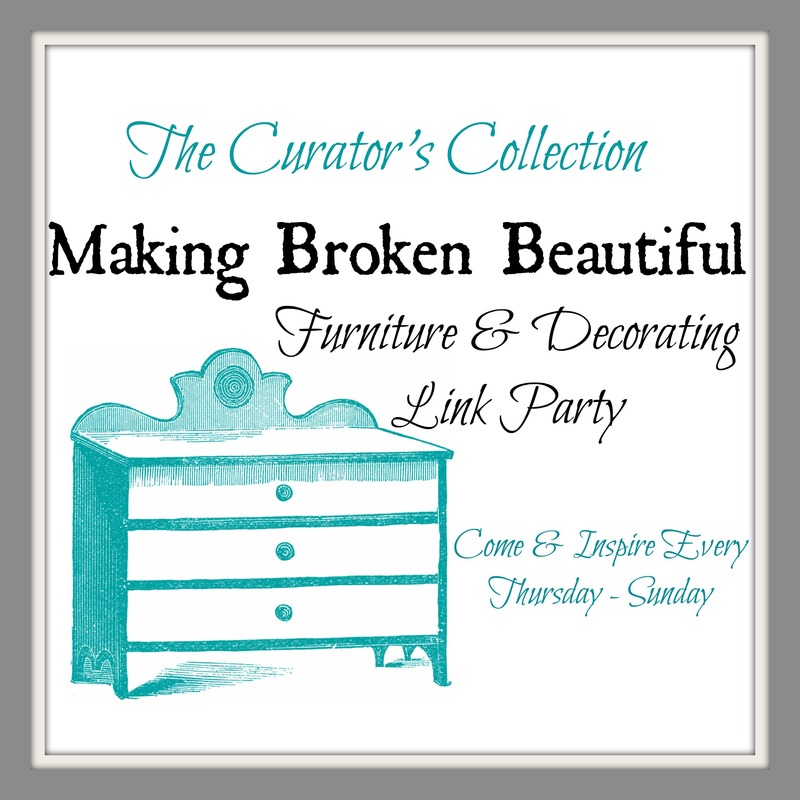 This link party is so inspiring. Well deserved! Thank you so much for sharing! Hope you have a good weekend! Nice part, Terry! Thank you for the invite! Thank you Janet! I’m so happy you can visit! I hope you enjoy your weekend! Love this week’s features. Thanks for the party and hope you have a great day, Terry. Thank you Mary! I hope you enjoy the party and a great weekend as well! Thank you for the visit! Thank you so much for the party Terry – it’s so nice to see it growing more each week. Have a great weekend, it looks to be a nice warm one in our neck of the woods! Thank you Marie! It’s so exciting to see it grow! Thank you for linking up all the time .. you are faithful! I appreciate the support marie and I hope you enjoy the warm weekend too!